We would like to thank all those who have given support to this project from the local community, Warwickshire Wildlife Trust, the Forestry Commission, the Pond Conservation Trust, Alvecote and Shuttington Parish Council, Maurice Arnold, and all the contractors and friends, family and volunteers who have worked on the site and given us advice and support. We are developing Alvecote Wood according to our Woodland Management Plan that has been agreed with and grant-aided by the Forestry Commission under the English Woodland Grant Scheme. Are you another woodland owner needing advice? Would you like to read our Tree Safety Policy? Why does a wood need management? 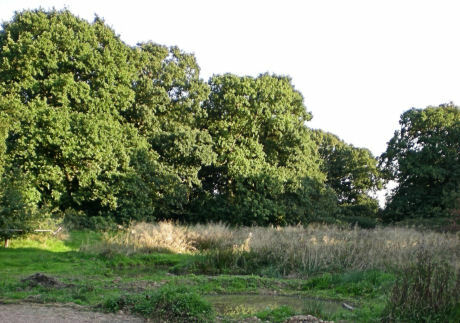 When we purchased Alvecote Wood in October 2007, the site had been neglected for about 15 years. It seems perverse, but woodland needs management in order to provide the maximum range of habitats for the animals and other plants that live there. Without management a number of things that are detrimental to biodiversity and presevation of the habitat can happen. Oak trees are very long-lived, with specimens alive that are over 500 years old. An oak woodland needs to regenerate, by which I mean new trees need to be allowed to self-seed and grow up to replace those that die and fall due to natural processes, including disease, old age, lightning strikes and wind damage. Without regeneration, a woodland will tend to age and eventually all the trees will tend to die at the same time, leading to a large and rapid reduction in the tree area available. So, opportunities need to be made for new trees to grow. In order to grow, new saplings need light, and this can only be provided in gaps in the main canopy. This can occur naturally, or gaps can be made by thinning the main canopy in areas where all trees are of the same age, to allow acorns in the soil to germinate and grow into new saplings. Thinning is often needed where new saplings are growing too close to each other for each sapling to become a mature canopy tree - thinning gives the best chance of large mature oaks becoming the familiar woodland oak canopy that we recognise and love. However, other things need to be in place to ensure regeneration can take place, in particular protection from predators such as deer and rabbits, and lack of rapid-growing undergrowth and scrub that will overwhelm the small, slower-growing oak saplings. This includes elder scrub and in Alvecote Wood there is a problem with very vigorous bramble growth that is strangling some of the saplings trying to develop. Management has to tackle this to ensure there are healthy oak trees on the site in 20, 50, 100 and 500 years time. Another problem with ancient semi-natural native woodland is that non-native species often grow well in the habitat. If they grow faster than native species, the latter can lose out, and the woodland gradually becomes taken over by these non-native species, such as sycamore. In Alvecote Wood we have to take precautions against such encroachment. Non-managed woodland actually tends to become ecologically poorer over time because a few dominant species tend to take over the whole area. Managed woodland tends to have clearings, managed scrub or coppice, access tracks and rides with woodland edge where a wide variety of plants can grow, larger clearings, ponds, streams, ditches and so forth. Alvecote Wood had few clearings and these were gradually becoming overwhelmed by brambles and elder scrub. Existing ponds were silting up. Other areas were becoming waterlogged and mature oak trees were dying as a result. There were virtually no access tracks, and therefore the woodland edge habitat was poorly developed. Maintenance of and development of new habitat areas is therefore a priority for us. This section of the web site tells you about developments at Alvecote Wood - our objectives and woodland management plans, how we plan to make things better for trees and the other species that live in woodland, how we are improving existing habitats and developing new ones, and how we hope to improve access to the site for management and for visitors.